The Affair of the Cuban Sonic Weapons Attacks appear to have been consigned to the dust bin of media interest and governmental action. The inaction by the U.S. government appeared particularly telling. In that respect the last event of note took place on January 9, 2018, when Senator Marco Rubio chaired a meeting of the Subcommittee on Western Hemisphere, Transnational Crime, Civilian Security, Democracy, Human Rights, and Global Women's Issues entitled "Attacks on U.S. Diplomats in Cuba: Response and Oversight" (discussed HERE). During the public portion of those hearings, Senator Rubio chided the State Department and its then leadership for failing to constitute an Accountability Review Board (ARB). He was informed that such a board was constituted but only on December 11, 2017 and that notice thereof was sent somehow to the Senate by the Secretary of State's office. Senator Rubio remained skeptical (HERE). He was right to be skeptical. Since then, the only interesting progress in the Affair has been among academics who continue to study the possibility of such an attack (see, here and here). Yet the State Department has done its duty. It has been reported that the ARB constituted in December 2016 "is expected to issue its recommendations to Pompeo by the end of this week, a State Department official has told CNN, after which he will have 90 days to relay his plans to Congress." (Secretary of State Pompeo Creates Task Force in Response to ‘Unexplained Health Incidents’ Affecting U.S. Diplomats CNN Wire Service, June 5, 2018). But a change geo-politics has given the Affair of the Sonic Weapons Attack a new and potentially more profound life. The reasons for the change have little to do with Cuba--it may have everything to do with China and the increasingly intense negotiations to reshape the structures of U.S.-China relations. It seems that the Affair of the Sonic Weapons Attack has now moved from its backwater early stages in Cuba to the center of the negotiations between Chin and the U.S. respecting the state of their relations for the next generation. In this high stakes game the addition of sonic weapons attacks raises the stakes and the risks as both powers deploy all their weapons to ensure advantage in the comprehensive negotiations that are taking place substantially out of the limelight. More thoughts of the Chinese perspective HERE; .The Affair of the Sonic Weapons Attack Goes Global--From Cuba to China in the Emerging "Big State" Era of Global Trade and Relations. As a consequence, in addition to the specific focus on Cuba through the investigations of the ARB, the Secretary of State has now announced the creation of a task force to to respond to “unexplained health incidents” affecting US diplomats and their family member--not just in Cuba but elsewhere as well. (US sets up task force on diplomats sick in Cuba, China) It seems that sonic weaponry (at least as a metaphor for whatever the major powers are now fooling with in terms of offensive gadgetry) has gone global. At the very least it may become a potent element in the tool kit of bilateral negotiations in furtherance of the America First Initiative. The success of these uses will depend on the ability of the parties to manage (or control) the scope and quantity) of media responses and their effects on moving mass opinion. The text of the CNN Wire reporting follows. The State Department has created a task force to respond to “unexplained health incidents” affecting US diplomats and their family members, Secretary of State Mike Pompeo said Tuesday. Officials have characterized the incidents as “sonic attacks” or “acoustic attacks” because they often coincide with a high-pitched sound. The source of the attacks, which have occurred in Cuba and now possibly China and apparently began in late 2016, remains unclear. The unit, called the Health Incidents Response Task Force, will be led by Deputy Secretary of State John Sullivan and include representatives from other US government agencies, including the Department of Health and Human Services and the Department of Justice. 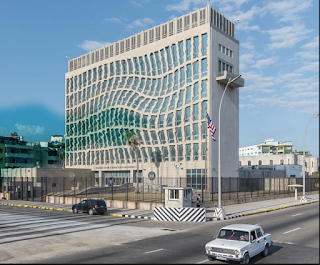 In late 2016, embassy personnel in Havana, Cuba, began to report hearing strange noises and experiencing a string of similar medical symptoms, such as hearing loss, headaches, vertigo and other signs consistent with mild traumatic brain injury or concussion. The incidents in Cuba seemed to stop after August of last year. Then, last month, the State Department announced it was looking into a similar incident affecting a staffer at the US consulate in Guangzhou, China. Pompeo first announced his decision to create the task force at a hearing last month, during which members of Congress expressed concerns over the unsolved incidents. Pompeo’s predecessor, Rex Tillerson, was also vexed by the incidents and launched an Accountability Review Board to review the occurrences in Cuba. The board is expected to issue its recommendations to Pompeo by the end of this week, a State Department official has told CNN, after which he will have 90 days to relay his plans to Congress. In addition, the State Department is “currently reviewing the incident in China and determining how best to proceed,” the official said.